Big rings are in and I love them. They bring any outfit to life, and add something fun to even the most boring jeans and simple shirt. Having a cocktail ring for every outfit would be fantastic, but of course stones are expensive – especially large ones. Stefano Patriarchi makes a gorgeous golden sterling silver ring that will go with everything. The band is adjustable so it will fit most fingers. My gold standard (no pun intended) for any piece of jewelry is finding something that goes as well with jeans as it does with dress pants. I'm a day-to-evening kind of girl. And this ring is perfect for that. Patriarchi has a whole collection in the same style as the ring, which can be seen on his website. He's all about simplicity, which in itself is special when so many designs lately are over-embellished. For something that's not real gold, $258.00 is a bit pricey, but if you factor in that the ring will be worn every day (or it would by me, at least), it's a winner! Photo above is from forzieri.com. Cheating on your fiancÃ© is justâ€¦ lame. I think we can all agree that if you're already shopping for a different model before the wedding, the long-term prospects don't look good. Apparently John Gunther, 27, was still "shopping" when his fiancÃ©, Danielle Cavalieri, 26, found out she wasn't the only girl in his life. She called off their engagement. Gunther demanded back the engagement ring, which is the ultimate in classless under the circumstances, but one would think that Cavalieri would have immediately returned the ring once she found out that her fiancÃ© cheated on her. Personally, I would have encased the ring in a concrete brick before giving it back. Anyway, Cavalieri felt differently and wanted to keep the ring (weird – but if it looked anything like the Blue Nile ring pictured above, I kind of get it) so Gunther took her to court. Unfortunately for the girl, they live in NY and the court ruled that any jewelry given "in contemplation of marriage" needs to be returned. So she lost the ring. But she won the war – she's marrying someone else on Saturday. And presumably, any future dates of John Gunther will find the press about the case readily available online. Hopefully that will make any future girlfriends of his aware of who they're dealing with! Photo above is from bluenile.com. Dear Kimmie, Since Spring is around the corner, I'm not focusing on mass spring cleaning around the house! I want to focus on taking myself to another level and putting myself out there. Although I know that it is important to network, I have always done so with others – but there are times I have to be there on my own, what can I do to put my best foot forward as I never know what to expect? I love being out and about and more often than not, I have to go to places alone (maybe I meet up with people later or I find that I don't know anyone else there). I find that it's important to dress where I feel that I am presenting myself the way I want people to see me. This means that I am known for my accessories so a large ring is a must. 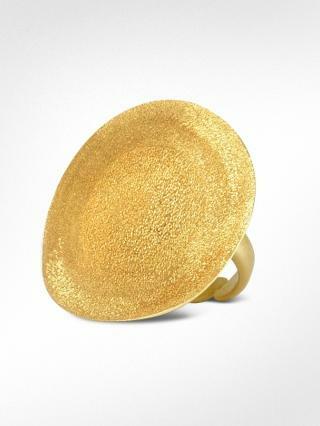 I love this Dome Ring which is available at Vivre. It's perfect for the Spring and catches everyone's eye! One, it makes me comfortable but two, it causes people to find their way to ask about what I'm wearing. Having a conversation starter can be a lot easier than asking the same old questions such as what do you do and why you're here. Asking someone where they got their ring or other accessories lends itself to other questions and you insure that you will be remembered. Think about a favorite handbag and one that looks different than what most people carry and allow that to be your signature. You'll find it easier for you and you'll worry less about those awful ice breakers at events! If you read this blog, you know my taste, but if you know me, I'm anything but predictable. I have very high-brow/low-brow taste in art, movies, books and jewelry. 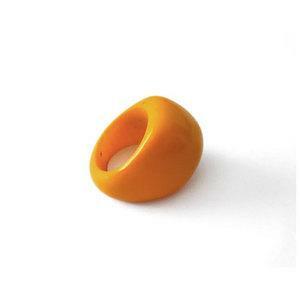 Case in point: the Tagua Nut ring. Definitely low-brow and 100% me. I was shopping in La Jolla, and chanced into a Fair Trade boutique that had these crazy rings made from Tagua Nuts the size of an egg. Grown in the South American rainforest, the nuts fall from a tree and then are dried until they're rock hard. Some people call them "vegetable ivory", so hard is the final result. They can be carved into beads or rings that are often dyed striking colors. Because each nut is unique, each ring is completely different. And they are really, really cool. They're big and chunky and fun – and buying them benefits the local people who carve the rings. And did I mention they're cheap? Yes – there's that too! So keep an eye out at your local boutique, or just go online here or here or here to grab one! I confess: I covet. I covet the jewelry from M. Khordipour Enterprises. This store on 47th Street in New York is a feast for the eyes. Even on "jewelry row" with bling in every window, Khordipour (as I fondly call it – as if it's an old friend) stands out with quality jewelry the like of which you've never seen. What I love about their collection of estate jewelry is how intricate and delicate everything is – the pieces are so unique! They also make a few designs of their own. I swear they have a group of elves in the back room, because everything they turn out is so pretty. I sent a friend of mine to their website to check out their rings when she was looking for an engagement ringâ€¦ which led to the idea that a colored ring might be fun instead of a diamond. I mean, why not? If you love it, buy it. 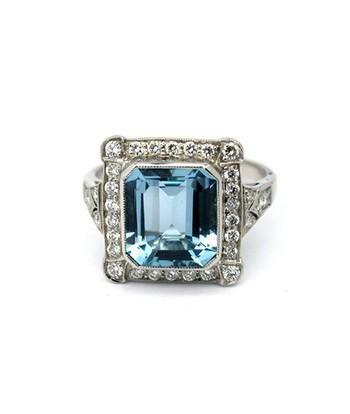 This aquamarine and diamond ring is so stunning, it's hardly a "right hand ring," as they call these things today. It's truly a piece for a special occasion. And soâ€¦ I covet. Isn't that one of the seven deadly sins? I love its beautiful stone, and most of all the fabulous setting. I know they say a diamond is a girl's best friend. But in this caseâ€¦ the competition is hard to beat! Tacori Engagement Rings… You Wish? If it were up to you, would you rather be surprised with an engagement ring– you know, just like the romantic and creatively planned surprise wedding proposals you see in the movies where the guy magically pulls out a ring as he asks the question– or would you rather pick your own engagement ring? Of course you'd like to receive something you actually would want to wear (and well, perhaps flaunt, to your friends and family). But how do you even broach the topic of choosing rings without sounding too presumptive? Not only would that be considered tacky, it can also be a bit awkward with budget and payment issues if your significant other doesn't have a deep pocket. Those Tacori engagement rings are stunning, but can he afford it? Sometimes, it's also not a simple question of what he can spend on a ring, but how much he wants to spend on a ring. Ah, I say let him figure it out. Ultimately you'll have a wedding band anyway, and that's when you can have your say! The original Claddagh ring is generally attributed to Richard Joyce of Galway. Joyce departed from Claddagh, a small fishing village where the waters of the River Corrib meet Galway Bay, on a ship enroute to the plantations of the West Indies. His ship was captured by Mediterranean Algerian pirates and the crew were sold as a slaves. Richard Joyce was sold to a Moorish goldsmith who trained Richard in his craft. Richard Joyce soon became a master goldsmith, and handcrafted a ring for the woman at home he could not forget. In 1689, he was released after William III came to the throne of England and concluded an agreement whereby all his subjects who were held in captivity by the Moors were to be allowed return home. 6mm from top of crown to tip of heart. Available in sizes 5 – 9. The Moorish goldsmith offered Richard his only daughter in marriage and half his wealth if he would remain in Algiers. Richard declined and returned to Claddagh to find that the woman he loved had never married. He gave her the ring he had made, and they were married. He set up a goldsmith shop in the town and began making rings. The earliest claddagh rings to be traced bear his mark and the initial letters of his name. 7.2mm from the top of the crown to the tip of the heart. According to tradition, the ring is taken to signify the wish that Love and friendship should reign supreme. The hands signify friendship, the crown loyalty, and the heart love. These rings were kept as heirlooms with great pride and passed from mother to daughter. Today, the ring is worn extensively across Ireland, either on the right hand with the heart turned outwards showing that the wearer is fancy free, or with the heart turned inward to denote that he or she is spoken for. The pride of placement is on the left hand with the heart turned in, indicating that the wearer has found true love. Yellow has been a favorite color since this past winter, and what better embodiment of that trend in jewelry than gold. Though it's ever so pricey, yellow gold has made a comeback in a big way this year, and rings continue to be bold and chunky. So I set out to find some beautiful gold rings that won't put a gigantic dent in your bank account. Surprisingly, I found a wonderful selection at HSN. Midas-touched in polished yellow gold, this ring showcases a puffed yellow gold heart dangle. The heart features a textured, rhodium-plated heart design in the center with a prong-set, round diamond accent, for a splash of sparkle. Polished finish, tapered shank, so cute! Pure gold is too soft to withstand the stresses of every-day wear, so it is alloyed with a mixture of metals like silver, copper, nickel, and zinc to give it strength and durability. Caratage, indicated by a number followed by k, indicates purity, or how much of the metal in a piece of jewelry is gold. Caratage is expressed in 24ths, 24k gold being 100% gold. This stunning yellow gold bypass ring showcases a thick, overlapping design. The ring's sleek polished side overlaps atop a sugary satin-finish side, for a sinfully asymmetrical appearance. Measures approx. 13/16"L x 13/16"W x 1/8"H with 3/16"W shank. Tapered shank. Made in Italy. Of all metals, gold is the softest and most malleable, yet has exercised the strongest hold on the human imagination. It appears naturally in its metallic form, and can be fashioned into complex shapes with the simplest bronze, bone, or wooden tools, meaning that gold could be worked into tokens, personal adornments, and talismans by the earliest craftspeople. Fashioned from polished yellow gold, this picturesque ring features a wide silhouette with an openwork floral motif on a satin-finish backdrop. Creating a bold, yet feminine look upon your finger, this golden garden radiates elegance. Polished finish, tapered shank, made in Italy. The price of gold jewelry is dependent upon the purity of the gold used or karat weight, as well as the design and construction of the piece of jewelry. The color of the gold is determined by the type of metal alloys included in it, and the percentage of each alloy. 18k gold contains 75% gold, which is alloyed with other metals to make it strong enough to withstand everyday wear. Now, these are all 14k gold rings – 18k is not in my budget. Because 14k gold is composed of only 58.3% gold and 41.7% other metals, its gold color isn't as rich as 18k gold. 14k gold is most commonly used where strength is most important, like in earring backs and bracelet clasps, but if I can have a nice 14k ring – or none at all – I'm going for it. This impressive yellow gold ring boasts a sizable, eye-catching square table with a concave silhouette. The table showcases a snakeskin design, while open geometric cutouts on gallery let light pass through the hand-polished piece. Split tapered shank, polished finish, made in Italy. Pure gold doesn't react with other elements to create tarnish – the residue that accumulates on some metals before transferring to your skin as a stain. Sometimes people have allergy or staining problems with metals that are combined with gold, but the gold itself is rarely a problem. Enhance your style with a touch of opulence when you wear this elegant ring. Polished yellow gold is crafted into a bold, slightly domed square with an intriguing openwork design. Cutouts in the top of the square form a swirling, brocade-like pattern that reveals a layer of translucent blue enamel, while filigree scrolls form an open gallery along the sides. This allows light to reflect through the sapphire-colored enamel, simulating the rich look of stained glass. The raised, dimensional-looking square appears to float atop a polished band, which feels smooth and comfortable on the finger. Made in Italy. A customer favorite! To clean gold jewelry, use a solution of warm water and detergent-free soap and wash gold gently with a soft-bristled brush – an old toothbrush works well. Store gold pieces separately in soft cloth bags or in their original boxes to protect them from the exposure to harsh daily elements. Smooth, silky and irresistibly seductive, this ring is a striking testament to your sophisticated taste. 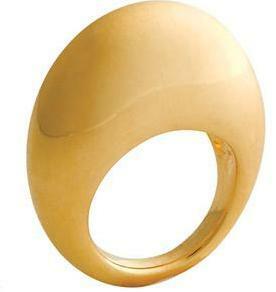 Sculpted from yellow gold, this highly polished ring has a modified cigar band silhouette with a concave center. Flattened edges and tapered shoulders produce a square shape in front, lending a geometric flair to the dramatic design. Tapered shank. Made in USA. Palladium is a platinum group metal, which also includes platinum, ruthenium, osmium, iridium, and rhodium. These metals are found together in nature and have similar qualities. They are white in color, extremely durable, and unaffected by elements in the air that make other metals tarnish. Palladium was first used for jewelry when platinum was declared a strategic metal and reserved for military use in 1939. Celebrate that special moment with a wedding band that's stylish yet subtle. A brushed-finished center offers a textured look that appeals to the eye. Glossy ridged edges give it a modern twist. An intricately-patterned center is the highlight of this palladium wedding band. It is bordered by milgrain details and capped off by glossy edges. It shows a modern twist on the classic band. Milgrain is the raised beaded edge on the ring that is done with a special engraver's tool. This wedding band features a hammered finish around the center of the band. Glossy edges border the center with fancy milgrain detailing in between. Palladium alloys used for making jewelry products are typically 95% pure palladium and 5% of other platinum group metals such as iridium and ruthenium. The palladium alloys are white, hypo-allergenic, lightweight, durable, and easy to finish and polish. These alloys have a specific gravity close to that of 14k white gold, and are close to half the weight by volume of platinum making them an excellent choice for jewelry. The natural white color of palladium is permanent and unlike white gold does not require rhodium plating. Rhodium plating wears away over time making white gold jewelry more yellow in appearance and requires the owner to have the setting re-plated to renew the white color. This is not necessary with palladium. 950 Palladium is more durable than white gold. Wear testing has shown a 15% longer wear ratio. This is similar to how platinum wears versus gold. Over time, palladium will show the signs of everyday wear, but the surface is easily restored to the original luster by cleaning and polishing. In virtually all jewelry circles, platinum is still considered to be the king of metals. 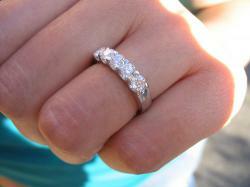 Platinum wedding bands are 60% to 70% heavier than gold or palladium wedding bands. They are extremely durable and will last much longer than comparable gold wedding bands. Also, high world-wide demand for platinum has driven prices much higher recently, making platinum wedding bands a great investment. Even the name Platinum denotes the highest standard available. If your budget allows, platinum is still the most highly prized and expensive of all metals. Palladium, however, offers many of the same desirable characteristics of platinum, at a much lower price. It is as white as platinum and whiter than white gold. Palladium wedding bands provide wearers with the same durability and premium white beauty that platinum wearers have learned to treasure. The best part is that palladium wedding bands cost a little more white gold, but much less than platinum wedding bands.